He is the past-president of the European Association for Osseointegration (EAO) and a past-Board member of the Osseointegration Foundation (OF). He is an honorary member of the South African Society of Periodontology, was the program chair of the EAO 2000 scientific congress, as well an award recipient from the American Academy of Periodontology, the California Society of Periodontists, and the German Implant Society (DGI). 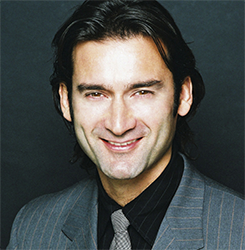 Dr. Jovanovic's clinical research emphasizes esthetic management in dental implant therapy and bone and soft tissue reconstruction techniques. His applied research focuses on bone regeneration with different bone graft materials, growth factors and barrier membranes as well as the biology of soft tissues around teeth and implants. Observe the experts, Dr. Sascha Jovanovic and Dr. Mamaly Reshad as they perform various surgical procedures at gIDE Institute and ArtLab Dentistry. A maximum of five participants per course will closely watch our experts in this intensive 3-day course. This CE course will give you thorough understanding of the biologic principles of applied surgical techniques including step-by-step procedures. Learn the latest techniques for successful sinus elevation and bone grafting, implant placement and complications/periimplantitis in this all encompassing 1-day clinical course developed by Dr. Jovanovic.Class size is limited to 24 participants and includes lecture and hands-on workshop on fresh upper goat sinus models. This course is part of the 4-day Advanced Implant Therapy training and may be taken separately.Participants receive 1 clinical video DVD on Sinus Elevation as review material.COURSE FEE INCLUDES DVD:VDL-05 DVD Sinus Elevation & Grafting by Drs. Istvan Urban and Sascha A. JovanovicINTERACTIVE LECTURE (1/2 Day)A critical viewing of biological and clinical aspects of sinus elevation techniques including the key elements for implant success will be presented. Patient Selection and CT-Diagnosis. Flap Management, sinus elevation techniques, and suturing methods. Decision making and clinical protocol in osteotome versus Lateral window approach. Bone Grafting layering protocol with autograft, Xenograft and barrier membrane. New technology grafting protocol using rhBMP-2/INFUSE and bone fillers. Choice of implant system for sinus cases and when to stage the sinus bone graft? Diagnosis of problems and management of sinus complications HANDS-ON LABORATORY WITH GOAT MAXILLA MODEL (1/2 Day)Participants will practice on fresh goat maxilla models, with the latest implant designs, microsurgical sinus hand instruments, osteotome instruments, bovine filler materials and resorbable membranes and rhBMP-2/INFUSE bone graft. Lateral window approach using bone-cutting instruments. Internal sinus elevation using Osteotome techniques. Bone graft layering technique with barrier membrane. rhBMP-2/INFUSE bone graft and filler protocol. Implant placement technique. Extraction and sinus treatment. Flap management and suturing methods. Each workstation is equipped with implant drill unit, dental implants, fresh goat maxilla model, sinus hand instruments, bone filler material, membrane, rhBMP-2 graft, suture materials and all disposable materials. LEARNING OBJECTIVES Learn to perform sinus elevation surgery predictably. Identify the clinical and practical benefits of minimally invasive osteotome sinus elevation. Learn the technique for performing highly predictable lateral window surgery. Identify a biological protocol using graft materials for sinus elevation. Learn how to prevent and treat complications. Learn the latest techniques for successful bone regeneration and grafting for implant placement and ridge augmentation, esthetic implant procedures and socket grafting in this 2-day clinical course developed by Dr. Jovanovic.Class size is limited to 24 participants and includes lecture, hands-on workshop on fresh lower porcine models and live surgery observation. This course is part of the 4-day Advanced Implant Therapy training and may be taken separately.Participants receive 2 clinical video DVD on Ridge Augmentation and GBR as review material.COURSE FEE INCLUDES DVD:LCS-01 DVD Advanced Implant Therapy - Vol. 1, 3rd Edition by Dr. JovanovicLCS-02 DVD Advanced Implant Therapy Ridge Augmentation - Vol. 2, 2nd edition by Dr. JovanovicDAY 1: AM - INTERACTIVE LECTURE (1/2 Day)Biological and clinical aspects of advanced implant and bone reconstruction including the key elements for esthetic success will be discussed along with steps to manage the patient and the implant site.LEARNING OBJECTIVES: Treatment planning and patient selection for grafting procedures. Concepts and techniques in bone grafting from incision to suturing. Extraction site management: immediate versus delayed implant placement with bone and soft tissue grafting. Immediate extraction site techniques with internal grafting for maximum tissue preservation. Prosthetic steps to assist in grafting and implant procedures for the clinician. New technology using BMP2 grafts. DAY 1: PM - LIVE SURGERY OBSERVATION (1/2 Day)During this 4-hour session 2 live surgery cases will be demonstrated. The first case is a posterior case for ridge and sinus augmentation purposes. The second case is an anterior esthetic case where details for optimal implant placement and site development will be demonstrated. The live surgery session is video taped through a high-quality macro 2-camera angle and a live audio feed for interaction between participants and the clinical team.DAY 2: AM - HANDS-ON PORCINE LABORATORY (1/2 Day)Participants will practice on mandibular pig jaw models, with the latest implant designs, microsurgical hand instruments, bone tacks, bovine filler materials and resorbable, membranes and rhBMP-2 growth factors with ti-mesh. The training treatments will be: Tooth extraction with simultaneous implant placement and bone grafting with membrane placement. Horizontal ridge augmentation with simultaneous implant placement, bone grafting with resorbable membrane placement. Vertical ridge augmentation with rhBMP-2 / INFUSE graft, Ti-mesh, bone tacks and bone fillers. Each workstation is equipped with implant drill unit, dental implants, fresh pig jaw model, hand instruments, bone filler material, membrane, BMP-2 graft, titanium mesh, fixation pins, and all disposable materials. DAY 2: PM - INTERACTIVE LECTURE with TREATMENT PLANNING (1/2 Day)Vertical and horizontal aspects of ridge, bone and extraction site augmentation The quality and quantity of existing bone within the implant site will be examined, and a variety of augmentation approaches will be addressed, including: Potential intra-oral donor sites, as well as techniques for harvesting such sites. Bone filler materials and rhBMP-2 growth factors. Resorbable and non-resorbable membranes for localized ridge augmentation. rhBMP-2 / INFUSE grafting and protocol results. LEARNING OBJECTIVES: Clinicial solutions to biological bone regeneration and socket grafting. The optimal selection of implant design, surface and position. Learn the use of biomaterials and rhBMP-2 with autogenous bone and barrier membranes. Treatment planning for esthetic cases and the development of gingival papilla support. Complications, possibility of treatment and prognosis. 4-DAY ADVANCED IMPLANT THERAPY and GRAFTING COURSE in Los AngelesLearn the latest implant planing and treatment steps for successful soft tissue management, socket preservation, immediate extraction site implants, implant placement with simultaneous GBR, staged horizontal and vertical GBR, growth factor selection, bone and soft tissue harvesting, ridge splitting, esthetic implant procedures, crestal sinus osteotome, lateral sinus grafting, periimplantitis and complications taught using didactic, comprehensive and clear clinical protocols. Each course day has a didactic presentation using lecture and video material and a clinical hands-on or live surgery demonstration. This 4-day program is offered three times yearly and is limited to 24 participants. It is one of the best short-term immersion implant programs to get you to the next level in implant surgery and to improve your confidence level in hard and soft tissue grafting and the management of complications. Registrants of the full 4-day course receive an Advanced Implant Therapy and GRAFTING Certificate upon completion. You will also receive four clinical video DVDs, one for each course day as review material. The gIDE training center is located in West LA in the so-called "Silicon Beach" area, 20 minutes from LAX airport and 10 minutes from the Santa Monica coast line. Several hotels are walking distance or short driving distance as well options for health oriented or fine dining. And visit Los Angeles if possible at the same time, the most exciting, dynamic and creative hub in America. There are always sports, music and theater events which can be enjoyed at end of day. This specialized course with Dr. Sascha A. Jovanovic & Dr. Mamaly Reshad is designed for chair side mentoring of surgical placement and restoration of implants on live patients by course participants. Procedures that will be featured are bone grafting, All-On-Four, sinus lift, immediate loading protocols and provisionalization, prosthetic planning – advanced and simple cases. The small class size allows for the best learning and supervised practice environment where participants will place and immediately load at least 2 arches. You will be mentored step-by-step through the entire process by the best collaborative team in implant surgery, prosthodontics, and dental technology. All course essentials are provided, including patients, materials, and training which allows participating dentists to concentrate and benefit from the fullness of the experience. There are 10 key criteria that are important in implant therapy to achieve optimal soft tissue outcomes. The criteria are divided into 2 areas. The first area involves the biomaterial elements in therapy, while the second involves procedural issues. The biomaterial elements of implant surface, the implant neck, abutment material, the sub gingival abutment design, and abutment reconnection will be discussed. The procedural elements covered are implant spacing, implant vertical positioning, bone and soft grafting and provisional management. This presentation will focus on the 10 key criteria as applied in implant therapy for selected patients. The last few years have seen major advancements in biological understanding of peri-implant soft tissues, bone regenerative results and implant aesthetics. These advances have allowed a very precise 3-dimensional implant position and a predictable restorative result with natural beauty and gingival harmony. Results from 3 clinical centers with the new scalloped implant to maintain inter-implant bone and papilla tissues will be presented. A panel discussion will be moderated between the 3 presenters. This special presentation highlights in 2 consecutive lectures, the clinical and biological criteria to consider in ridge and sinus grafting using autogenous bone, bone filler materials and resorbable and non resorbable membrane configurations. The first part of the presentation highlights the indications and solutions with resorbable membranes and bone graft materials around implant exposures and in sinus treatment. The second part focuses on the possibilities with the vertical ridge augmentation technique using non-resorbable TR-membranes and bone grafts in posterior mandible and maxilla and the anterior maxilla. A question and answer period of 30 minutes with both lecturers concludes the session. The options of treating the edentulous jaw will be described in detail. Radiographic and clinical analysis will demonstrate which option can be used by the dental team for implant and prosthetic reconstruction.Mandible:This lecture will discuss the surgical treatment steps of the mandible with 2, 4 and 6 implants and its prosthetic outcome for removable or fixed benefits.Maxilla:This lecture will discuss the surgical treatment steps of the maxilla with 4, 6 and 8 implants and its prosthetic benefits.Medications for surgical treatment and pre-operative planning will be discussed. Tissue preservation is the main focus of this presentation. This lecture will discuss in detail the indication and steps for immediate tooth replacement of a healed and a fresh extraction socket. The needed bone quantity and quality, soft tissue biotype and implant choice and stability will be presented. Flapless surgery has increased in indication due to its simplicity and atraumatic healing capacity, but needs to be executed carefully to ensure implant success.